We are a dental office devoted to you! I’m Dr. Bruce Lockhart and I would like to personally thank you for visiting my dental practice website to learn more about the special care our patients receive at Lockhart Dentistry. I can’t tell you how often I hear from patients that no other doctor has ever taken as much time to thoroughly explain to them what is going on with their oral health, what that means in their over all health and what their options are. We have patients that drive hours to and from the office for their routine care appointments because the trust factor and the quality of care they receive. So if you have had enough of being treated like a number at your dental office then come see us at Lockhart Dentistry and become part of our dental family. 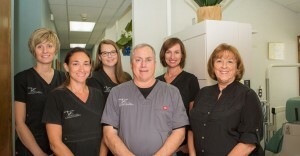 Our philosophy is to provide quality dental care in a warm and friendly environment. Working together as a team, our staff of trained professionals provide this care in a thorough and comfortable manner. Youʼll enjoy personalized care like youʼve never had before. From our North East Indianapolis office, we serve Geist, Fishers, Carmel, Westfield, Pendleton and the surrounding areas.